There are tons of cross-platform chat services out there. But most of these services are offered by organizations whose infrastructure is built around advertisements. Those organizations promise to keep the user data secure but they fail to do so sometimes. This year’s Facebook–Cambridge Analytica data scandal and Google Plus security breach are good examples of that. So, if you need complete privacy and security, going with a decentralized P2P networking based service seems like a good idea. This article covers 5 free P2P chat services. With these free services, you can securely chat with other users on the web. These services use peer-to-peer decentralized networking to make your chat encrypted and secure. The first four websites are available for multiple platforms including Windows, Linux, MacOS, iOS, and Android whereas the last one is a LAN-based Windows-only service. Some of these websites support Rich Text Format for the chat and allows you to share files and the rest of them only support regular text with one or no feature on top. So, let’s check them out one by one in details. ZeroNet is a set of open, free, and uncensored websites offering various services. It itself is a decentralized service that uses Bitcoin cryptography and BitTorrent network. Due to that, it is always online and you can access it from anywhere. All the websites are self-hosted and served by the visitors which deliminate the hosting cost as well. ZeroMail is an end-to-end encrypted P2P messaging system. You can create a ZeroID on this service and have a secure and encrypted conversation with other ZeroNet users. The chat here is text only; it does not support media and RTF. 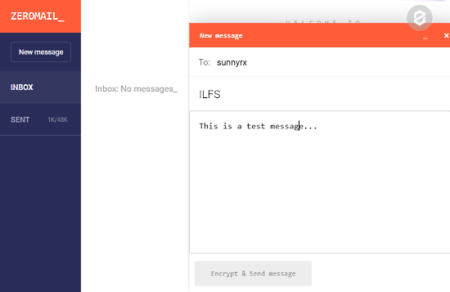 You can simply type a recipient username along with your text and then encrypt and send the message with a single click. This service also has an Inbox and a Sent folders where you can fetch your messages. With all that, it is a simple and secure P2P chat service for Windows, MacOS, and Linux. Download this P2P chat client from here. 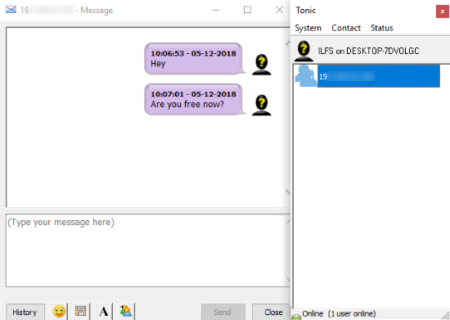 Brosix is a multi-purpose cross-platform P2P chat client available for Windows, MacOS, Linux, Web, Android, and iOS. 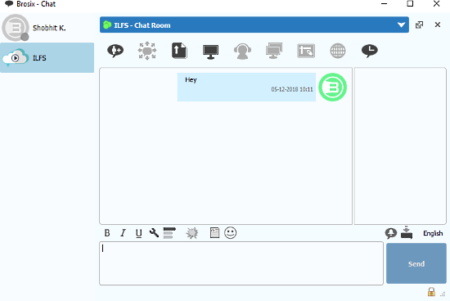 It is a feature-rich chat client with text chat, text conference, chat rooms, screen sharing, whiteboard, and much more. With Brosix, you can have a peer-to-peer encrypted conversation with other people on Brosix. You can also create chat rooms and add invite others to join. It is free for personal use and comes with a monthly subscription for teams and businesses. You can download this P2P chat client from here. Ring is a free communication platform based on P2P networking. It is a cross-platform service which you can use on Windows, Linux, Mac, iOS, and Android. You can install Ring from Microsoft Store on your Windows PC and then create an account by entering a unique username along with other info in order to use the service. After creating an account, you can send invitation or contact request to other people to add them to your Ring contact list. Once the other users accept your request, you can start a secure and encrypted one-to-one conversation with them. Ring only supports regular text in the conversation. You can not send any attachment or media file via this service. However, it does support video chat. On top of that, it also gives you to set a custom device name, resolution, and frame rate to your information confidential. 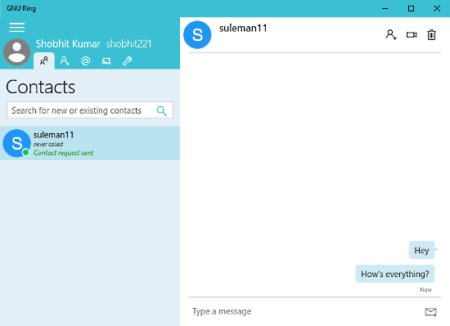 Grab this P2P chat client from Microsoft Store. The next free P2P chat client for Windows on this list is Ricochet. It is a P2P anonymous instant messaging service available for Windows, MacOS, and Linux. Ricochet uses Tor network to connect you to the other users directly without relying on any intermediate service. The Tor network gives you complete anonymity on the web and Ricochet also eliminates the metadata for complete privacy. This P2P chat service doesn’t use accounts, instead, it assigns you a unique text string which will be your receiving address. 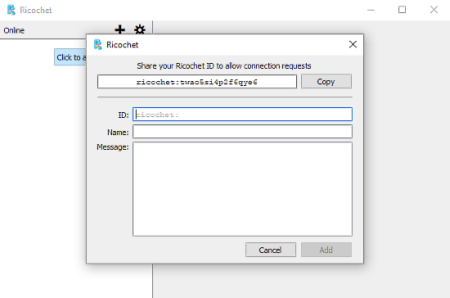 You can add other Ricochet users to your contact list by their Ricochet ID and send them text messages. Tonic is a P2P based service that gives you the convenience of instant messaging over LAN. With this service, you can chat with other people on your local network. It is good for the school, college, organization networks and makes working together easy and secure. Tonic uses your IP address as your username which saves you from the hassle of creating an account or picking a unique available username. You can find easily find all the Tonic users on your network and add them to your contact. In the chat, you can send regular text messages with customizable font options, send Unicode emoji, and share files without any size limit. Tonic is available for Windows only. These are free cross-platform secure P2P chat services which you can use to have encrypted and secure conversations with others on the web. Give them a try and share your thoughts with us in the comments.